There is no way to predict when something like a tsunami might strike. The same might go for an earthquake, a tornado, a flood, or a terrorist bombing in the place that you live. There is no place in the world that you can ever be truly safe. This experience has shown me that I do not want to live my life with fear and regrets. I want to know that my life has made a positive difference in the lives of those around me. I believe that there is a loving God who wants a personal relationship with all of us, and I want to know Him better. I want to be sure that everyone I care about knows how much I love them. And I want to share the wonderful love of God with others in any way possible. Our trip around the world continues with this website to chronicle the journey. I hope that we can share with you our messages of hope, encouragement, love, and dreams. And as we travel the world, we hope to touch the lives of many more people and make a positive difference. 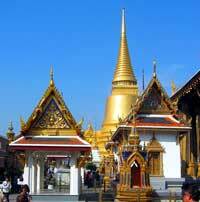 One of the major attractions in Bangkok are the historical temples and palaces. Our first day in the city, we jumped into a tuk tuk which is a like a golf car or atv which has been turned into a taxi. They are all over Bangkok and with a little bargaining you can get around the city for next to nothing. We visited the Temple of the Emerald Buddha and the Grand Palace. Both were built circa 1782. When you enter the grounds, you must be dressed properly (no shorts, sleeveless tees, non-heeled shoes). So at the entrance, everything from shoes, socks, shirts, and sarongs are rented for a small fee. Both David and I ended up looking a little ridiculous as we donned mismatched sarongs and shirts. It certainly made for an interesting fashion statement!! 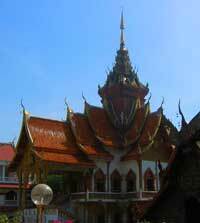 The temple grounds have multiple buildings with golden chedis (cone shaped domes), detailed murals depicting religious and wartime stories, beautiful and intricate mosaics made with bits of colored glass and mirrors. 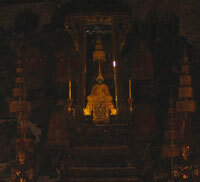 The Emerald Buddha is a small sacred statue that has had an interesting history. 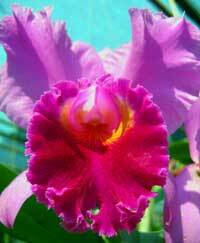 It was discovered in the 15th century in Chiang Rai. Supposedly, the image fell and lost its plaster covering to reveal glowing green. It may have been covered in an effort to protect the statue from raiders. 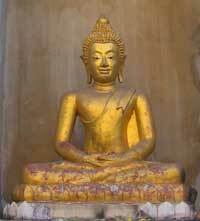 The image traveled all over Thailand and Laos, and finally came to Bangkok in the 1700’s. The Emerald Buddha actually has 2 or 3 royal costumes that changed with the seasons by the king in a very elaborate ceremony. Technically, you are not supposed to take photos of the Emerald Buddha, but I was able to snap a photo from outside the temple before one of the guards waved me away. One of the other cool displays they have on the temple grounds was a miniature Angkor Wat (see David’s Journal Page). Angkor Wat is a historic Buddhist temple and palace that is actually in Cambodia. It was built in the Khmer style hundreds of years ago and is now a world heritage site. You may have spotted it in movies such as Tomb Raider. The people in those times believed that their kings were in incarnations of the gods, such as Shiva … etc. Each temple and palace had to be successively grander and larger to indicate the power and strength of the “gods” it housed. The largest buildings on the grounds is the Grand Palace. 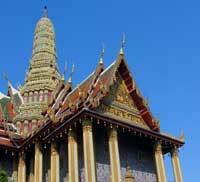 It is only used for ceremonial occasions now and is an amazing blend of both Thai and European architecture. The roof looks like a Thai temple, very tall and pointed. But the exterior of the palace looks like something you would see in Paris or Rome. Apparently, the ashes of former kings are kept in the heavily ornate spires that top the palace. From the palace, David and I jumped on to one of the river ferries with a host of other tourists. When we got on the boat, we had no idea what direction or where it was going. But hey, we are always up for a little adventure! We were all crammed onto the deck and then set off down the river at an alarming rate of speed. The river that flows through Bangkok (much like the Seine river of Paris) is choked full with long tails, barges, and speedboats all rushing along this aquatic highway. From the river you can see high rises, temples, and right into private homes. As we approached each new stop it was a little like a crash landing as the ferry bumped hard into the dock. Then the attendant would blow on his shrill whistle and people would rush to get off the ferry. Between ferries, subway, tuk tuk and the train, getting around Bangkok was a breeze. Over the weekend, we headed for the amazing Weekend Market (AKA Chatuchak). The market must cover at least 10 city blocks. You really could get lost in a place like this! But that is not necessarily a bad thing. Everything you could ever want or imagine is found here. But this isn’t a market just for tourists (even though they abound here). The local people come to shop here too. They estimate that over 200,000 people visit the market in a day. It was a great place to practice our bargaining skills. We saw everything from cute cuddly puppies to clothing, jewelry, antiques, household goods, opium pipes, military surplus, food, flowers, arts and crafts … It was an absolutely fantastic afternoon. We ended up coming away with some great bargains. And there were many times when I wished that I could just go on an outright shopping spree! If you ever plan on being in Bangkok, you should definitely check out this market! Great shopping is also to found all over the city. They have some amazing shopping malls! A shopper’s paradise! Eating is assuredly a major pastime in Bangkok. They have every possible cuisine that you could want. Our friends took us to some great little hole in the wall places that served up delicious food. One place in particular had heavenly deep fried garlic fish. Another place had Asian-Italian fusion cuisine. Who would have thought that some of the best pizza we ever ate would be right here in Thailand! But some of the best places to eat were right on the street. We tried to be careful when eating out at these little places. Ah, but the smells were so inviting! One of my personal favorites was all the little fruit stands. You could point to whatever fruit you wanted -- pineapple, papaya, mango, dragon fruit, and they would cut it up for you right there! The Thai experience can not be complete without a visit to the spa. Or at least that is what my friend’s wife, Yu, told us. The Thai people are renowned for their massage skills. Massage as a healing art is a centuries old tradition here in Thailand. She took us to her favorite day spa for a relaxing afternoon of aromatherapy and massage. Now neither David or I has ever had a massage professionally done before. But I am starting to think that this would be a great thing to add to my weekly activities. They massage your body from head to toe with lovely scented oil and work out any and all kinks that you may or may not have known about. You come out feeling relaxed, loose, and limber! Outside of Bangkok there is lots to see. We made a day trip to the historic town of Ayuthaya which is about 70 km to the north of Bangkok. Ayuthaya used to be capitol of Thailand 400 years ago before it was destroyed by the Burmese. There are some amazing temples and palace ruins there. Our friend Vivorn dropped us off on the outskirts of the city in the late afternoon for a little exploring. To our dismay, the first site we tried to visit has just been closed for the day. Essentially we were stranded in the middle of the Thai countryside without any real way of communicating. So we walked towards the modern day town center where there was a great little night market that had just started. There were little stands everywhere with local goods, fruits and vegetables, watches, VCD’s … We must have been the only westerners there. David towers over the Thai people at over 6 feet and we got a few long stares. We finally figured out where we could find a tuk tuk to take us into the old city ruins. What we didn’t realize was that we had another 25 km to go and that our driver who spoke minimal English had no real idea where we wanted to go. It made for a long ride through the Thai countryside passing rice paddies and small local temples. So we made a pit stop to consult with our driver by using the Lonely Planet I had brought along to point out where we wanted to go. Since he was still a bit confused, he stopped to discuss the problem with a local shopkeeper. Finally, just as the sun was beginning to set, we arrived at our destination. The old city of Ayuthaya is an amazing place. Towering chedis and crumbling brick buildings are scattered across the city. As it becomes dark, the park officials turn on spotlights to cast an eerie glow onto the ruins. Ayuthaya served at the capital from 1350 to 1767. At its peak, Ayuthaya had a population of over 1 million people and was courted by many foreigners who claimed that it was most amazing city they had ever seen. Before it got too dark, we were able to visit 2 of the main ruins. First we visited the Wat Phra Mahathat (Wat means temple in Thai) which dates back to the 14th century. It had an amazing collection of Khmer-style towers and chedis. 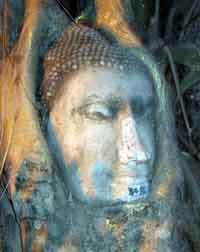 One of the most impressive things was a Buddha head that the roots of a tree had grown around. We must have walked around the ruins for a good 30-40 minutes. When we got back the front gates were locked! We had no idea how we were to get out!! Sure, we could sleep in old temple ruins for the night with headless statues, bats, and wandering dogs … Well, we decided to walk a little bit more. Eventually, we found our way out. 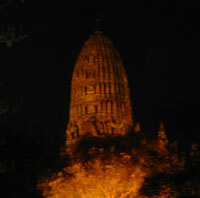 Our second stop for the evening was the Wat Ratburana which had a huge tower that looked much the leaning tower of Pisa. This is one of the main meeting halls for the old city. We wandered around a bit more, but to our dismay, most of the Wat’s had been closed for the evening, so we decided to make our way back to Bangkok. We grabbed a tuk tuk and headed for the train station. Now our train ride back into Bangkok was certainly one of the most entertaining evenings that we have had in a long time. We met some very interesting characters on the train. All very friendly, but also very confused!! I’ll have to let David that part of the story, so check out his journal page. From Bangkok, we headed to the northern city of Chiang Mai. This is a major tourist destination for all its outdoor activities such as whitewater rafting, rock climbing, and hiking. 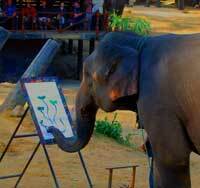 Chiang Mai is also known for its work with orphaned elephants and the isolated hill tribes. 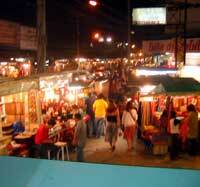 And finally, Chiang Mai is renowned for its daily Night Market that tourists flock to. You can find amazing bargains here. In fact, many people who are in the import/export business come to Chiang Mai for deals on lacquer ware, china, teak furniture, Thai silk and clothing. David and I had a fascinating time exploring the city of Chiang Mai which has been a trading destination for hundreds of years. The old city is surrounded by a brick wall and moat. Inside the city, there are numerous temples to visit. 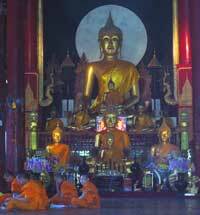 One of the most visited temples is the Wat Phra Singh built in 1345. It was absolutely beautiful with its gold leaf roof and brightly colored interior. Supposedly the Buddha image inside comes from Sri Lanka. Some of the old temples are made entirely out of beautifully carved teak wood. Their spires and rooflines are just amazing and delicately ornate. All over Chiang Mai you can see Buddhist monks, both young and old, walking around in their bright and colorful orange robes. From what I understand, all young Buddhist men are expected to become a monk for short period of time. They learn to meditate and are taught by older and wiser monks. By spending time as a monk, families earn religious merits through their sons. Really they are just the same as everyone else. You see monks using cell phones, riding on mopeds, eating ice cream, and playing soccer. We had a great time in Chiang Mai. We really packed in the adventure since we were only there for 2 days. We hired a tuk tuk driver for one day and he took us all around and outside the city. It was pretty exciting as we puttered up the steep hills that surround Chiang Mai. Everyone was passing us -- mopeds, cars, trucks, bicycles … We visited the elephant farm and saw how a relationship between the elephant and the mahout develops. The baby elephants were so cute! They taught the elephants how to blow through their trunk to play the harmonica, paint a picture, and kick a soccer ball for a short show. For $25 dollars you could take a ride on an elephant through the jungle. From there were headed to a beautiful orchid farm and then the local snake show. 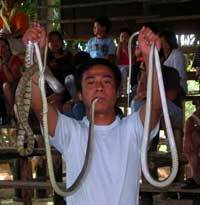 Apparently, Thailand has some very deadly snakes such as cobras. 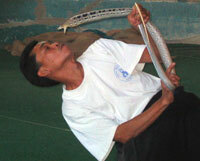 I sat in amazement as the snake handlers whipped snakes around inside a small ring. The snakes would rise up and then strike out at their handlers with vicious speed. Occasionally they would get snagged on the snake handler’s pants. 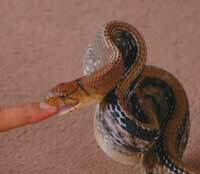 Some of the handlers ever kissed their snakes right on the head!! Ewww! One of the funniest moments was when the handlers pretended they were taking out a deadly snake from a cage and then threw a piece of rope right into the audience. They threw the rope right into the middle of a group of very macho looking men who screamed in fear and then instantly scrambled for the highest seats in the bleachers. But enough of snakes … eh. 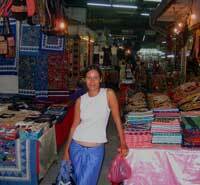 One of the highlights of visiting Chiang Mai was the Night Market. Vendors would come and set up shop right along the street. 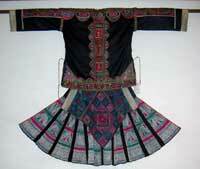 Many of the vendors sold goods made by the northern hill tribes who are known for their beautiful embroidery and weaving. The market definitely catered to tourists. 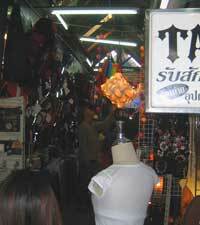 You could find illegal DVD’s, rip-offs of Louis Vitton and Gucci, loads of t-shirts and clothing, silverwork, amazing wood carvings, silk scarves … One should definitely come to Chiang Mai in the mood to shop. And the great thing is that the prices are so affordable. For example, you could buy a cashmere pashmina for about $10 and silk scarves for sometimes less than that! 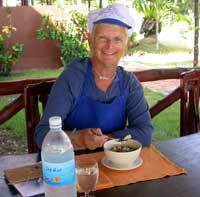 Hotels, guesthouses, and food are very affordable in Chiang Mai. 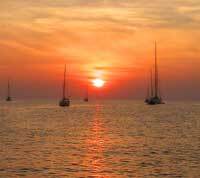 If you were truly traveling on a shoestring, you could make it here for under $10 a day! At the Night Market, David got to practice his rock climbing skills. They had a huge climbing wall with loads of chairs so that people could watch you make your way up. I got to practice my bargaining skills and came away with some great little buys for myself and for family. I think the best buy that we made in Chiang Mai were our wedding bands! David and I found a great little contemporary jewelry shop on one of the many side streets. We have been looking here and there as we travel, and Chiang Mai definitely had some of the best jewelry that we have seen. Our last night in Chiang Mai was a memorable one. David was approached by some girls from the local university to help fill out a questionnaire for their English class. Since we had a few hours till our flight out of Chiang Mai at 11 PM, we decided to help them out and had a fun time answering questions about welfare programs, orphanages, and smoking. To help themselves learn English, they recorded our conversations. It was fun getting to know them. To thank us, they went off and bought us some beautiful little souvenirs of Chiang Mai. So all in all, Chiang Mai was an excellent destination. I would recommend it to anyone who wants to visit Thailand. I am sure that if we had had more time there, we could have had loads of other adventures. From Chiang Mai we headed back to Bangkok and then back to Phuket. It is nice to get back to the boat and see everyone. 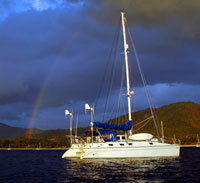 We are now anchored in another bay near a lovely little beach. We will be leaving from Phuket soon. Our next stop will be Maldives. From there it looks like we will be heading towards the Med via the Suez Canal. Overall, our visit to Thailand has been fantastic. The people have been some of the nicest we have met. The islands have been some of the most beautiful we have seen. The tragedy of the tsunami has been heart-wrenching. We have helped out where we could by giving of our time and our resources. The response we have seen in Thailand has been amazing. Life is Phuket is getting back to normal. The beaches are clear. The hotels and restaurants are open. Sadly, many of the tourists have not returned. Phuket’s industry is largely based on tourism and is now suffering during a season when they should be doing very well. Now they only wait for you to discover this amazing country! My "illegal" snapshot of the Emerald Buddha! in the air on a golden pedestal. Maybe I should consider a career as a papparrazi! Our awesome friend Vivorn and his daughter, Witty. This driver got lost on our way to Ayuthaya! Ready for an excellent adventure! Not exactly my idea of a good time! I firmly believe in shopping till you drop! Making friends in Chiang Mai! With helped these girls with their English homework.